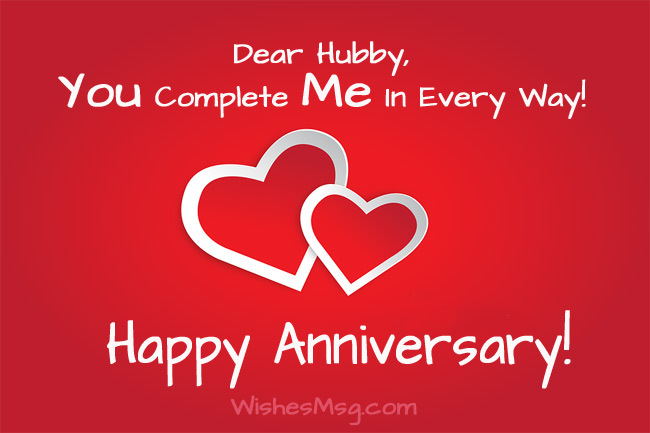 Anniversary Wishes for Husband : Anniversaries are special days in a marriage. It’s a celebration of togetherness. It reminds a couple many happy years of loving each other and taking care of each other. It’s a happy occasion that marks every milestone of a successful marriage. Your wedding anniversary can be the perfect occasion for thanking your soulmate for his contribution in the married life. It’s a time for expressing your proudness for him. Thank him for being a responsible partner. If you are a wife and looking for some words of appreciation for your beloved husband to greet him on your anniversary, you are in the right place to find the best anniversary wishes for husband. Here we have some really wonderful, romantic and funny collection of anniversary wishes for husband. Choose the one you think would be best for thanking your husband. I’m one lucky wife in this world who is blessed with such a loving and responsible husband. I thank god every day for having you in my life. Happy anniversary! I want to thank you for being not only my husband but also my soulmate and the biggest supporter of me. Happy anniversary dear! I am proud of you! It’s a day to celebrate all the memories we created throughout this year. 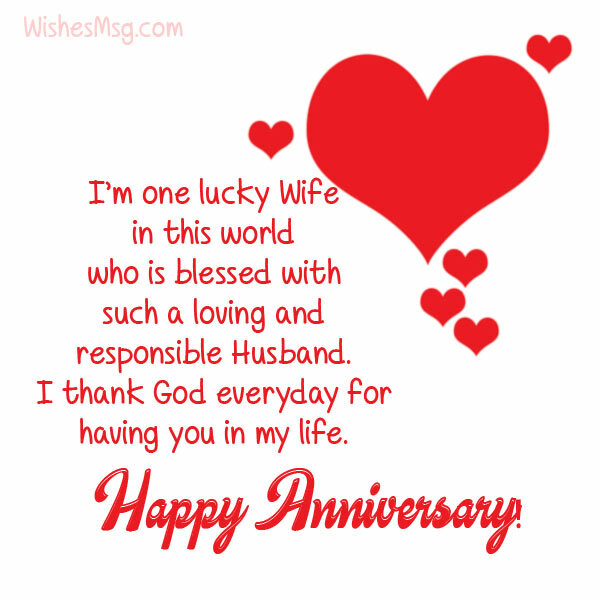 I want to wish a great anniversary dear husband. God bless you! I want to give you a big hug today so you can understand how much I really love you. you mean a lot to me. I want to be with you till my last breath! Happy anniversary! It’s just our first anniversary together and I can already tell you and I will celebrate at least 50 wedding anniversaries together. Happy first wedding anniversary my love. Good moments pass away so fast. I can’t believe we have just spent one year together under the same roof. I wish I could stop the flow of time when I’m with you! One year has gone knowing each other, taking care of each other. And, I swear, I have never known someone more wonderful than you. Congratulations dear! It’s our first wedding anniversary! Every day and every moment with you is special. But today we are going to celebrate all those special moments we shared together. Thank you and I love you! I fell in love with you so deeply in just one year that I don’t think I can ever live without you in my life anymore. Will you stay with me forever? Happy anniversary dear hubby! Today is the most special day of my life. I have spent a wonderful year with the person I love most. Nothing could make me happier than this. Happy first wedding anniversary! I don’t know what good I did to deserve you in my life. I feel like the luckiest wife in this world. I want you to be with me until the last moment of my life. I love you! Happy anniversary to you for putting up with all my craziness. Because if you did not put up, you know there wouldn’t be any happy anniversary after all! Thanks for being with me all these years and still not killing me while I am sleeping. I may be a bit annoying but I know you are patient enough to tolerate me! happy anniversary! I want you to stay with me for the rest of my life. Because I really need someone to yell at every now and then. I love you a lot! Happy anniversary! It makes me emotional to think about all the things about me you have to put up with every day! But then I realize, if I can put up with yours, why can’t you with mine? I love you dear and happy anniversary! It doesn’t matter how old you are and how many anniversaries you have celebrated together, never let the wild, romantic side of you die. Make your anniversaries more special with some words of romance and appreciation for your husband!